(PhysOrg.com) -- The Mars rover Opportunity is a senior citizen, but still spry, and as it peers over the rim of the giant impact crater called Endeavour, it's embarking on what could be called a new mission, say its NASA guides. "You're coming along with us to a brand new geologic field site," said Steve Squyres, Cornell's Goldwin Smith Professor of Astronomy and principal investigator of the Mars Exploration Rover mission, addressing reporters during a Sept. 1 news teleconference. Squyres joined fellow Mars scientists from the Jet Propulsion Laboratory in Pasadena, Calif., and NASA headquarters in Washington to brief reporters on expectations for Opportunity's investigation of Endeavour crater. It arrived Aug. 9 at Cape York, on the rim of Endeavour, after a three-year journey of about 13 miles as it detoured to avoid numerous hazards along the way. Endeavour is an impact crater 14 miles in diameter. It offers tantalizing clues about the Red Planet's early formative process, according to the scientists. 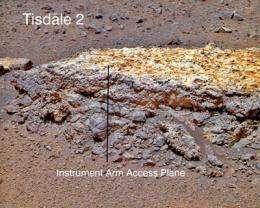 Squyres described Tisdale 2, the first rock Opportunity has examined at the rim of Endeavour. It is a breccia -- composed of chunks of fragmented rock, and pretty much what the team would expect to find in that location, Squyres said. However, it has the scientists excited because it's unlike any rock they've explored so far on Mars. Tisdale 2 is a basaltic rock that has a composition similar to some volcanic rocks, but most striking so far is the large amount of zinc in its chemical makeup, Squyres said. For rocks on Earth, zinc is an element typically associated with being formed in a place with hydrothermal activity. "This is a clue ... that we may be dealing with a hydrothermal system here," Squyres said. "We may be dealing with a situation where water has percolated or flowed or somehow moved through these rocks -- maybe as vapor or maybe as liquid. We don't know yet." It is too early to tell whether the rock's composition indicates evidence of water on Mars, Squyres said, but the initial observations point to what he expects will be a "long and interesting story about these rocks." Opportunity will next drive northeast to search for bedrock along Cape York. Questions to be answered, according to Squyres: Does the zinc composition vary from place to place? Is it concentrated along fractures where water can move easily? Does the zinc correlate with other elements also associated with moving water? The twin Mars rovers Spirit and Opportunity landed on the Red Planet in 2003 for what was expected to be a 90-day mission. 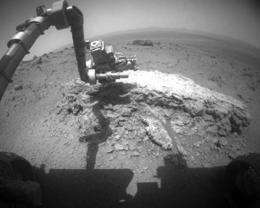 Spirit stopped communicating in May, and scientists are cautiously optimistic about Opportunity's scientific future, even after seven years of wear and tear. Interesting, here, zinc is a leftover from the formation of Earth's atmosphere, a chalcophile produced during redox. This is a keen insight to the early years of Mars. Here is a close up of the same spectacular object. No reason to resort to infantile trolling VD..